From college graduates moving into their first apartments to empty nesters looking to downsize, renting is on the rise in the U.S. In fact, according to Bloomberg, more than half of the 100 largest U.S. cities now have more renters than property owners. In a recent poll by the Insurance Information Institute, only 41 percent of renters say they have renters insurance. However, in a recent poll by the Insurance Information Institute, only 41 percent of renters say they have renters insurance. And in many of those cases, it’s only because landlords require it. Amica Insurance wants renters to be aware of all the coverage a renters policy offers, and for as little as $4 a week. Renters insurance provides coverage against fire, vandalism and theft, and it also covers clothes, electronics, furnishings and other belongings, even if they’re elsewhere, such as in a car. Amica’s Renters Essentials product* allows renters to customize their coverage, with added protection for electronics, including smartphones, and identity theft. For tenants planning to eventually buy a house or condo, Renters Essentials gives a yearly $100 credit – up to $500 total – which can be put toward an Amica home or condo policy in the future. 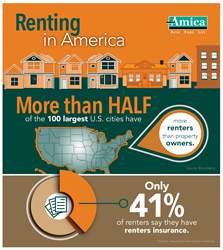 To learn more about renters insurance with Amica, click here. *This product may not be available in all states. Media inquiries can be sent to MediaCenter(at)amica.com.